To read the full history of the Persian breed click here. This colour variation originates in the 1920s in the UK. 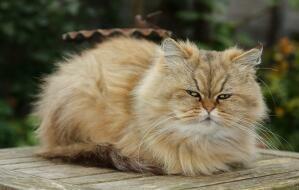 In America the Golden Persian has been recognised since 1970. When they first appeared in the 1920s in a chinchilla litter this colour was considered a mistake and they were dubbed ‘Brownies’. Fortunately since then breeders took a liking to the colour and worked to get the colour recognised. Golden to Apricot with seal-brown or black tipping.